Technology: always evolving, being modified, and improving over time. Swine barns follow this exact model. Think back to barns built almost 30 years ago. The production practices, barn construction, ventilation practices, and equipment to service the animals have all evolved drastically. The driving factor to these changes is usually to gain production efficiencies, ventilation efficiencies, and provide an overall healthier environment for the production animals that reside in these barns. After many years, positive pressure ventilation is returning to the swine industry. In the last 10-15 years there were two main ventilation methods that were used in barns: natural ventilation, mechanical (negative pressure) ventilation, and hybrid ventilation (a combination of the two methods). Positive pressure ventilation isn’t new to Double L. It was used in the Double L modular confinement buildings which were manufactured during the 80s and 90s. Double L was on the leading edge of technology then and understood the advantages of positive pressure. Now, due to swine diseases, this ventilation system is back in the forefront. Negative pressure mechanical ventilation systems would traditionally create a slight vacuum inside of the swine barn. During the winter, air would enter through the ceiling inlets and disperse through the room until it was exhausted through the pit fans or minimum ventilation fans. During the summer, the barns would utilize tunnel ventilation modes where the inlet in the barn would be an entire endwall that encompassed a cool cell, and the tunnel fans would exhaust the air at the other end of the building. Some of the drawbacks for negative pressure ventilation systems are all of the unplanned inlets that every barn will have. Every leak from holes in curtains, pit pump-out covers, leaky fan shutters, and cracks around doors will create an unplanned inlet from which air will enter into the barn. If you have enough of these unplanned inlets in your facility, the ventilation system will result in a drop in static pressure where the fans will move the same amount of air (or provide more air and therefore more energy usage), but the facility will be faced with poorer air distribution in the barn including “dead spots” and chilled areas. Double L’s DL3127 and DL4727 Inlets are great for precision air movement. In any barn that leaks in any location whatsoever, it is very important to be using the best equipment on the market to help mitigate the adverse effects from this leakage. The curved blades in the DL3127 and DL4727 Insulated Inlets direct air along the ceiling for proper air mixing. The end caps were also specially designed to maximize the air jet throw across any barn, minimizing the dead spots or chilled areas that can occur. The DL3127 and DL4727 Inlets have fully insulated blades and insulated housings to help minimize any condensation or freeze-up. The Double L EcoTight Shutter was designed to significantly improve fan performance and reduce air leakage. The side profile with individual Eco Adapter Blade Clips reduces shutter leakage better than any shutter on the market. The aerodynamic design of the shutter and louvers improves the efficiency of the fans, resulting in lower operating costs. 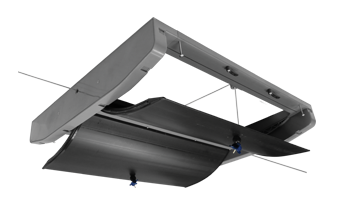 An easy option for retrofitting any barn – the EcoTight Shutter can help with better air distribution during minimum ventilation and better fan performance during maximum ventilation in one simple step. Positive pressure ventilation is not necessarily a new concept. Producers in the industry have been utilizing this technology for many years, but usually only in the highest value barns (i.e. boar studs). These systems have protected top tier barns in the country for years and now this technology is being applied to other production facilities as well. Why has this technology now gripped our industry and taken off? PRRS. This multi-billion-dollar disease grips our industry (almost) every year. PRRS, PED, Swine Flu, and Wasting Diseases all are major liabilities that producers and companies cannot control. Until now. Positive pressure ventilation system in hog barns is a technology that only allows filtered, uncontaminated air to pass through the animal occupied zones of swine barns. Air enters into barns through a filter bank and is distributed into the rooms with ceiling inlets. The air in the room is pressurized above the atmospheric pressure outside of the barn. This way, if there are any “unplanned inlets” where air could have leaked in with the filtered air, it now cannot due to the pressure generated in the room keeping it out. The concept is that pigs will no longer be subjected to contaminants that can compromise their systems. Don’t let your expensive positive pressure system be compromised by losing pressure in the room when a shutter blade gets flipped over or stuck in an open position. The Double L EcoTight Shutter was designed so there will be NO blade flip over or be stuck in an open position. The EcoTight Shutter was also designed to significantly improve fan performance and reduce leakage. The Eco Shutters are BESS Labs tested and based on a 30” shutter, this shutter provides 21.8% more airflow and 17.1% less air leakage than Double L’s current PVC shutter. The shutters can be built to custom sizes and are widely used today in the outlet dampers of positive pressure facilities. In these positive pressure barns, ceiling inlets are the primary inlet for air distribution for every season. Make sure to utilize the best inlet on the market to reap the maximum benefits from your positive pressure system. The Double L DL3127 and DL4727 inlets were designed to provide the maximum potential of air mixing and distribution in the room. The aerodynamic design and curved blade provide a quality basis for the positive pressure system to work with. The DL3127 and DL4727 inlets were also designed to minimize air leakage when they are closed. This is great for the producer as it enhances control of the pressure in the room. It also helps minimize propane usage in these facilities because you will have a minimal amount of air leaking into the rooms. All of these reasons really make Double L inlets the positive pressure inlets for the market. The costs associated with an air filtration system are more expensive than a traditional swine facility. When outbreaks can be prevented or the frequency of outbreaks can be decreased, there is real value/money to save in the long run with these positive pressure systems. Ensuring that all of your barns in any system are equipped with the most effective equipment on the market is a great way to protect the investments you’ve already made. The first 24 hours after birth is the most critical time in a baby pig’s life. Pigs born at the 102 degree warmth of the sow that come into a farrowing room of 70 degrees or less are very susceptible to heat loss. Chilled young pigs have reduced resistance to disease, are drowsy, and often fail to suckle properly. As a result, they run a higher risk of being laid on by the sow and/or never really get that good nursing start. Baby pigs have no fat to keep them warm. The only heat gain a pig has is through its intake. Heat loss, however, comes from a combination of cold structure surfaces, air temperature, drafts, and the flooring material the pig is constantly in contact with. 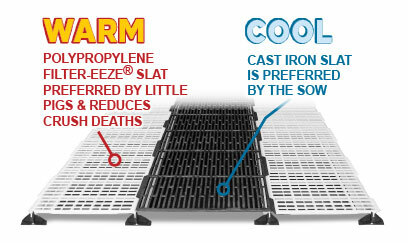 The greater the heat loss, the more feed it will take to offset that loss and produce gains. Before you purchase any flooring, lay your hand on it. If it feels warm to you, it will feel warm to your pigs. Flooring that feels cold to the touch will zap body heat from the animals. A cast iron and polypropylene combination is a nearly perfect flooring system for both the sow and the little pigs and is recommended by many producers. The cast iron is cool for sow and uncomfortable for little pigs so they are inclined to stay off of it and are less likely to get crushed. Producers reported they save at least one pig per litter from a crushing death, making the combination system very cost effective. The temperature in the room can actually be turned down 5 degrees and still maintain a comfortable environment for the pigs. What Is The Difference Between Recessed Wall Inlets and Flush Mount Wall Inlets?